I may be dreaming but I think I saw some plans on this site to construct a wooden dolly/rack to set an M series body on after a split from the frame. I don't want a rotisserie, just an inexpensive platform on rollers. If this rings a bell can someone send me a link or reference the article if it was on this site? I built one out of 2x4, bought four cheap, small furniture type dollys from Harbor Freight using the 20% off coupons. (The dolly was cheaper than the caster type wheel and is reuseable) It is built to be about 30 inches high and narrow enough to fit on the hat channels inside the body edges. at the rear I used 4x4 to level it out under the bed. Not hard to build and I used nothing but old scrap 2x4 on mine. I built mine a little long with a platform on the back so I could stand the tub up on it's end for painting. 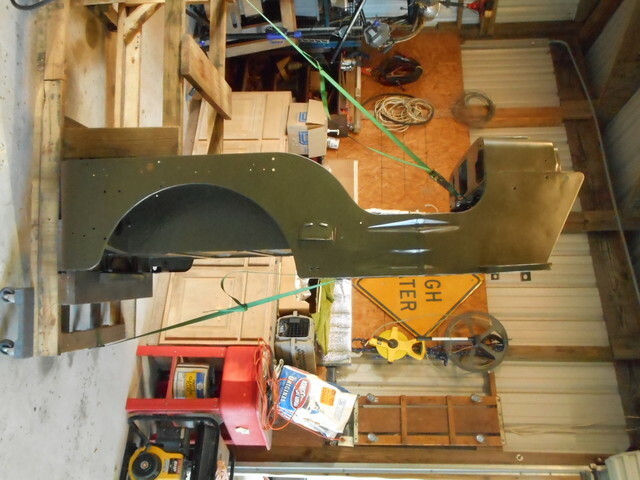 Attached is a picture that shows part of the roller stand with the tub on the back. I am out of pocket right now but when I get home in a few weeks I can send you a better picture. Hope this is helpful. Thank you. That gives me an idea. I made one out of two engine stands, but I never use it. I just man handle tue tubs, and Dodge tubs which are smaller than Jeeps, by lifting it on edge up and down, and moving it by pulling it on a big tarp. The rotating tub takes up room I do not have.